On a whim, I grabbed my old Squape R off the shelf. Old, ha ha... this is a tank that came out at later in 2014 which makes it a bit over a year old. I've only had it for about 5 months, and it's old. I threw a .45 Titanium build in it (6 wraps of 28 gauge Ti#1 on a 2.4 mm screwdriver), filled it up, and put it on top of my iStick TC40W (which I had upgraded to use Titanium wire with the secret handshake: Turn off the device, press the fire and the up button at the same time for 25 seconds, It should flash “Ti On"). The device was set to Ti mode and ramped up to 420 degrees Fahrenheit - where I always start. It's a mouth-to-lung or VERY restricted direct-to-lung draw, but the flavor was spot on and the temperature was only a hint too cool. Stepping it up to around 460 F was just about right. This got me to thinking about the temperature control problems I've heard people lamenting. They say it's too cool, or that it kicks in to temperature control immediately, or that they're not getting the flavor that they would like. Perhaps the problem is not the tech, but the pairing. Wanting to test this theory, I quickly put matching coils into all of the tanks from that era: an Erlkonigin, a Taifun GT V1 (I need to get the V2), a Kayfun V4. Each tank went on to a different mod. There was a bit of musical mod going on as I tested them out. Turns out that the SMY 60 TC Mini does not like the Kayfun V4 - burnt my mouth at 420. However, that tank is currently resting on the iStick TC40W and it's great at about 480 F. The Taifun GT V1 looks foolish sitting on top of the Cloupor Mini + (the tank is nearly as big as the mod), but it's producing a great, flavorful vape at 500 F. The Squape R eventually landed on the iStick 60 TC and about 480 F - again, with great results. Finally, the Erlkonigen is resting happily on top of the SMY TC 60 Mini at 420 F.
In this very small, unscientific test, I found that the temperature of the vape and the flavor produced was almost in direct proportion to the size of the chamber and chimney! The Erlkonigen has the smallest chamber and chimney and is the hottest vape at the lowest termperature. The Taifun GT V1 has the largest chamber and I needed to turn that one up the highest. The Squape R also sports a large chamber, but the chimney might be the smallest out there. There are known issues with temperature control vaping and the Kayfun 4, which might explain why it did not work on one mod, but did nicely on another. 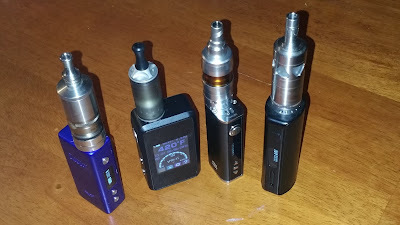 Perhaps the size of the chamber and the size of the coils in most modern sub ohm tanks is the problem. Huge chambers, huge coils, huge chimneys... these things either take too much wattage to heat up (which explains the success of the DNA200 with larger coils - more wattage), or have way too much air for the vapor produced. Likewise, cloud chasing, open and airy RDAs are not going to be able to concentrate the flavor the way a tighter RDA can. I know there's a number of people reading this and laughing, saying "Duh, I knew that all along." But I feel that there might also be a number of people out there that might have an old tank laying around that might like to try this themselves. There's likely another contingent that is thinking "no way could I ever go back to a draw that tight."